Mixed industrial gases are often more expensive than pure concentrations of gas. For that reason, it’s not surprising that businesses looking to contain costs consider switching from a mixed gas to a pure gas, but that response could backfire. Shielding gases for welding are mixed for a reason – they work better. These two or three-gas mixtures usually contain a mix of argon, carbon dioxide, and/or helium, hydrogen, or nitrogen. Each gas has its own special characteristics; used together, those characteristics work together to enhance or improve the welding process. Stability. Argon by itself provides excellent stability and smoothness in arc welding, but used by itself can lead to weld cracking issues. For that reason, it is often mixed with other gases that don’t provide the same level of stability, like helium. Spray Transfer. CO2 is valued for it’s ready availability, low cost, and ability to produce consistent, good welds. But, it does not support spray transfer well. This lower deposit efficiency can up the final cost of the welded piece. But when CO2 is mixed with other gases, like argon, spray transfer improves and the weld costs remain reasonable. Cleaning Action. Some of the materials to be welded aren’t very clean, especially if it’s a repair job. They may have scale or oil build-up that require special attention. Argon and CO2 mixtures are more tolerant of this kind of build up, whereas oxygen and argon mixes work better on clean materials. Helium provides exceptional wetting action, important for welding aluminum, copper alloys, and magnesium, but it does not produce a stable arc. For that, it needs to be mixed with a gas like argon or oxygen. The specific combinations and ratios of mixed industrial gases differ depending on the welding need. Ratios influence stability and arc control, wetting action, bead appearance, cutting depth, and even corrosion resistance in some cases. For those reason, you should never select your shielding gas based on cost alone. It’s too important an element in the welding process to be swapped out for the cheapest choice. 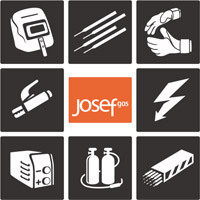 If you’re having trouble settling on a gas mixture, contact Josef Gas at 416.658.1212 or info@josefgases.com. We would be happy to help you choose the best mixture of industrial gases for the job at hand.